Daveswordsofwisdom.com: I send a balloon to heaven. 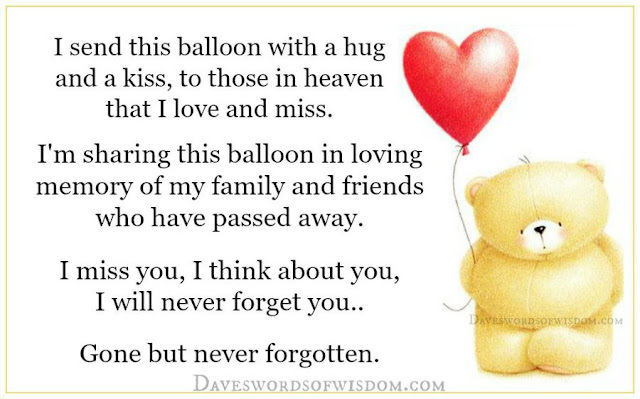 I send a balloon to heaven. to those in heaven that I love and miss. my family and friends who have passed away. I miss you, I think about you, I will never forget you.. I miss you son every day..l know in my heart you are in a better place..No more pain and suffering..You are with many loved ones who have gone before you...R.I.P. my Jason..❤love mom..
Dear dad I miss you every day, wish I could see you one more time to hug you and say I love you!!! Donald and Darryn mommy loves you one day we will meet and I will hug you forever never to let go. Dad take care of my boys until I get there m I love you. Love and miss you Jack.